Blessed with a voice so pure it permeates your body and washes away your troubles in one soothing note. - Shop now and save with free Mp3 download! Blessed with a voice so pure it permeates your body and washes away your troubles in one soothing note. 1) Is Satnam Waheguru Artwork Available with the Download? Yes! A PDF CD Booklet comes with each complete album Download. Satnam Waheguru is mellow and sweet, well suited for yoga class or as peaceful music to enliven one's spirit. The music is complemented by Spanish and Portuguese rhythms using instruments like guitars, keyboards, tablas and congos to support Manaka's beautiful voice. Review: "After listening to this album, I can say for sure that Manika Kaur should be known as "Magic" Kaur because there is pure magic in her voice. Manika has such a unique vocal tone - there's something rustic about it, but also modern. She has the power to draw in the listener from the very first line of her album, which is exactly what is needed for a devotional album. "Satnam Waheguru" is so soothing to listen to. The album successfully keeps the focus on Manika's singing without trying to overpower her vocals with loud instruments." Divine Grace felt when chanting! Sat Nam Ji!!! Thank you for this teaching..Your rendition of Jap Ji has helped deepen the vibrational connection with Guru Nanak! Hearing the correct pronunciation and pace and rythm brings one so much deeper in experience of this sound current...Wahe Guru! Mool Mantra a Life Changer..Become One..For me no other pauri allows for the pure essence of Guru Nanak to come through like mool mantra. The CD helps so much with the harmonious flow. Thank you Amandeep for sharing this New CD of Jap Ji! with the world.. Blessings L. A.
Manika Kaur - Kirtan for Causes Guru Ram Das Video. Manika Kaur - Kirtan for Causes Wahe Guru the Jouney Video. Manika Kaur - Kirtan for Causes Maaganaa Video. Manika Kaur - Kirtan for Causes Raam Raam Bol Raam Raam Video. Blessed with a voice so pure it permeates your body and washes away your troubles in one soothing note, Manika Kaur is a rare and gifted soul. Her songs are the music of true devotion and her mission is to heal the world with her voice, as Manika says, hers are "Kirtan for Causes" with all proceeds from her music going to charity. Her recent video "Guru Ram Das Rakho Sarnaee" has received an amazing worldwide response with over 4 million views on YouTube. On the heels of that success along with the success of her album throughout Asia - notably in India and the United Arab Emirates - Manika has teamed with Phoenix's long running label Invincible Music to release her album Satnam Waheguru in North America, Europe and Australia on January 21, 2014. Born and raised in Melbourne, Australia, Manika came from an extremely spiritual home where the family was, quite literally, responsible for spreading the teachings of the Sikh founder Guru Nanak Dev ji. Her family would have the Sikh Holy Scriptures brought to Australia and then personally distribute them to many Sikh homes across the continent. "It is impossible to describe the feeling of growing up in such a unique environment" says Manika, "every night our parents would tell us stories about our Gurus, and then later my brothers, sister and I would have 'jam sessions'. The boys would play the tabla whilst my sister and I would play the harmonium and sing Kirtan. It is the foundation on which I build my life." Growing up, Manika always dreamt of combining music, charity work and spirituality. Manika moved to Dubai after she married in 2006. It would have been easy to slip into a laid-back life in the lap of luxury, but in her words, "I knew I wanted to make a positive contribution to humanity but I had no idea how, so I prayed. 'Kirtan for Causes' happened without me even realizing and I feel blessed to be walking this path." Graced with a divine voice and writing poetry since she was little girl, Manika spent a lot of her growing years mimicking her favorite singers, musicians and ragis. Despite her lack of musical training, an Australian producer recorded an English song with her before she moved to Dubai. In Dubai, she recorded some more English music with another producer and went on to win a radio competition (by popular vote) for singing an original composition in December 2008. Her first recordings were in English with western producers until she met the "Prince of Bhangra" Sukhbir Singh at a social event and that's when Manika's dream of recording an album came to life. Her debut album Satnam Waheguru, is Manika's offering of beautifully delivered Kirtan - devotional chants and hymns relaying messages of love, peace and truth. As is typical in Singh's productions Satnam Waheguru features the usual Bhangra instruments like the dhol and dholak. The music is complemented by Spanish and Portuguese rhythms, while he also uses instruments like tablas, congos, guitars and keyboards to support Kaur's beautiful voice. In line with her 'Kirtan for Causes' mission, Kaur personally takes no profits from her album sales. She is currently supporting the S.O.S Initiative, a humanitarian organization focused on uplifting Sikhs in India out of poverty. Their S.O.S Initiative focuses on educating children and ensuring that they reach their full potential in hopes of breaking the painful cycle of poverty. When her album was released in Dubai and India she raised over a million dirhams, which helped finance a new Gurdwara (temple) in Dubai. Spreading the message has been surprisingly easy for 31-year-old Manika and music is her way of giving something back. "Music is a wonderful medium through which one can spread any message. God has been really kind to me, and I'm sure I can do more. I have been blessed with a very comfortable life, but I feel that I must do something for those less fortunate than me. And I honestly believe that if each of us can look out for others a little bit more, the world would be a much better place to live in. Music has no barriers, which is why it brings people together. At times you don't need to understand it but you feel it. Kirtan has something more extraordinary, when you connect to it; you are connecting to the purest love. This is why people often cry when they listen to or sing kirtan. It is hard to describe the feeling even for someone like me who is unable to fully grasp the true meanings of our Guru's teachings, it feels like floating in a warm pool of light!" You can visit Manika Kaur at Manika Music. Manika Kaur's debut Kirtan album, Satnam Waheguru, encompasses all of the above ... and more. She collaborated with internationally acclaimed bhangra/pop singer Sukhbir to create this CD, essentially to raise funds for the Gurdwara being built in Dubai. And in just over a month of its release, the CD has already helped to raise nearly US $100,000.00 for the construction of Guru Nanak Darbar at Jabel Ali, Dubai. 26-year-old Manika was born and brought up in Melbourne, Australia and moved to Dubai after she married in 2007. It would have been easy to slip into a laid-back life in the lap of luxury, but in her words, "I was sure that I didn't want to become just another socialite; I wanted to make a positive contribution to society, and at least try to make a difference. "Blessed with a divine voice and writing poetry since she was little girl, Manika spent a lot of her growing years mimicking her favourite singers, musicians and raagis. Although she had no formal training in music, an Australian producer had already recorded an English song with her before she moved to Dubai.In Dubai, she recorded some more English music with another producer and went on to win a radio competition (by popular vote) for singing an original composition in December 2008. A chance social encounter with the well known singer Sukhbir shaped her dream of recording a Kirtan CD to raise funds for building the Dubai Gurdwara.What started as an experiment to record a single Shabad, went on to become a unique musical collaboration between the two. "I wanted a Kirtan album which people could listen to by the seaside, something that had a modern contemporary feel. Sukhbir had already produced a Kirtan album for his father - which also featured a Shabad sung by Bollywood actor Akshay Kumar. But rather than impose his ideas on me or cramp my creativity, he actually enhanced it with his great musical genius. I think he is a spiritually gifted singer and I'm so lucky to have met him. "But with humility, Manika is quick to point out that it's the cause that is the major motivation behind the CD, not personal recognition. "The building of the Gurdwara is much bigger than me or Sukhbir or even this CD, for that matter. We are all so grateful to Sheikh Mohammed Bin Rashid Al Makhtoum (Vice President of UAE and ruler of Dubai), who donated a plot measuring 25,400 sq ft to the Sikh community, free of cost, to build the first Gurdwara in the United Arab Emirates. Many architects have collaborated to design the 100,000 sq ft building, and it is estimated that it will cost US $20 million. [More information about the planned Gurdwara is available at www.gurudwaradubai.com On his part, Sukhbir says "The new Gurdwara in Dubai was the inspiration for both of us. It may sound strange but it seemed that the project started by itself and before we knew it .... it was finished! Working with Manika was very easy, as she is a very versatile singer who sings in English or Punjabi with equal ease. Her vocal range is unbelievable! She sang the beginning of the Shabad titled 'Ram Ram' in almost a whisper and hit some really high notes in the verses! Brilliant!" Sukhbir goes on to add, "The vocal recordings, some of the pre-production and all the final mixes took place in the Darbar (prayer) room at Manika's residence in Dubai. For me, that in itself was an overwhelming experience, as Guru Granth Sahib's presence made it very very special for me. The violin was recorded in a hotel room in New Delhi, guitars were recorded in Mumbai and at home in Nairobi. I worked on the project in any conceivable place, from a seat in the airplane to the television room at home in Nairobi! ".The CD doesn't sell for a fixed price - in fact, people just use it as a means for a donation, with some individual donations running into thousands of dollars. Recalls Manika, "We had only just begun working on the CD and Sukhbir played the vocals to a family friend in Kenya. She was so moved that she immediately donated $1,000 to the CD, even though it hadn't yet been fully recorded, let alone released! That was just the beginning of the overwhelming response we've received from people the world over. It seems like everyone is eager to be a part of this collective building effort - even if to offer a single brick on the tiniest wall of what will soon become a wondrous house of God." As for Manika herself, she believes that, "Music is a wonderful medium through which one can spread any message. I know that there are many singers around the world who are much more gifted than I am, but God has been really kind to me, and I'm sure I can do more. I have been blessed with a very comfortable life, but I feel that I must do something for those less fortunate than me. And I honestly believe that if each of us can look out for others a little bit more - feed an orphan, donate some clothing to the needy, educate the poor, etc., the world would be a much better place to live in".Manika has gone on to record a music video for the song "Hallelujah," originally sung by Leonard Cohen. The song is featured on YouTube, highlighting issues of world poverty and impoverishment. "The lyrics of the song mean different things to different people, but I interpreted them as man's spiritual quest and the soul's misery at its separation from God." 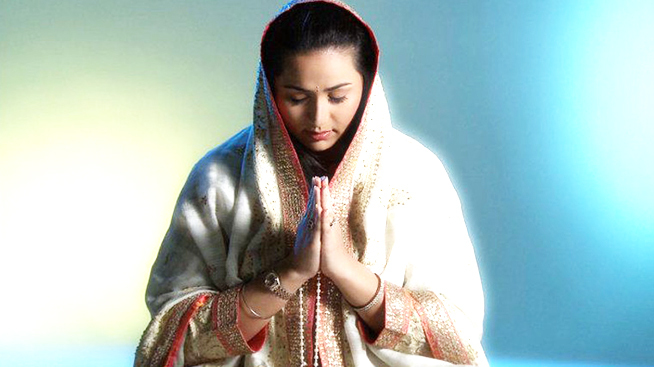 Manika's rendition of Gurbani in the CD Bandhana and her interpretation of Naam Simran with some lyrics in English have inspired her to produce another album along similar lines. Currently working on an album of English songs, she hopes to collaborate again with Sukhbir for another Kirtan album. Sukhbir echoes the same sentiments and says, "I loved every bit of making this CD and simply cannot wait for Waheguru to give me another opportunity to work on the next project!" By the sounds of it, divine causes find divine ways of bringing beautiful voices into heavenly collaborations. So let's all say hallelujah ... for more!